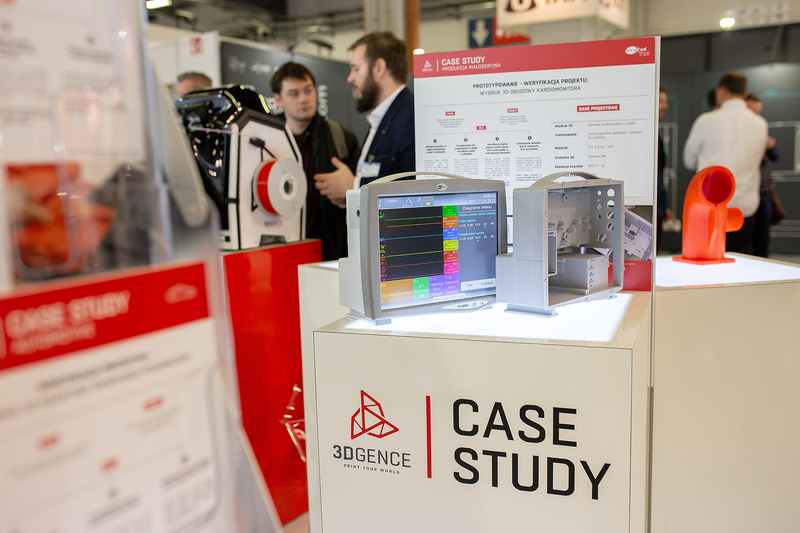 3DGence presented a new accessory for its flagship product – 3DGence INDUSTRY F340. The HF (High Flow) printing module introduced to the offer is characterized by the possibility of printing from reinforced materials such as PA-CF and PA-GF. HF module was implemented to meet the customer needs which are increasing applications of carbon fiber or glass reinforced materials in their work. Parts manufactured with PA-CF and PA-GF are characterized by increased thermal resistance, but also the hardness and durability. These plastics are commonly used in the injection process in industry and very well known to our customers. This is the fourth module compatible with the industrial 3D printer – 3DGence INDUSTRY F340 but the first one that has been equipped with nozzles of a 0.6 mm diameter. It also means that large prints can be done faster. The HF module just like the others is equipped with an automatic calibration system which makes it easier for users to work with the device. We decided to introduce a new module with 0.6 mm nozzles because it will allow us to produce details from ABS in a much shorter time than before. On some geometries, we get up to 40% shortening of the print time. 3DGence INDUSTRY F340, a 3D printer designed for industrial applications, is equipped with the modular system, that allows easy and tool-less module replacement depending on the required material. Each module is customed to a specific group of materials in order to optimize the printing process as much as possible. There are a lot of 3D printers on the market today, which are compatible with a very narrow range of materials, it is associated with the need to have several different devices. 3DGence INDUSTRY F340 is the exception in the industrial 3D printers segment. It has been equipped with a modular system, which is a more practical and more cost-effective solution. To print from a wide range of materials you do not need to buy a new machine, just replace the module. Customers can choose the ideal device to suit their needs, they can upgrade it and add other printing modules. Dominik Fitowski, Export Manager, 3DGence. Adding a fourth accessory to the 3DGence INDUSTRY F340 significantly increases the functionality of the device. This allows each customer to update their 3D printer during use.